Okay so you have a website that you are about to launch, you have created loads of awesome content, you have some of the best features that you can have for a website and you’re ready to roll. You know that your visitors are going to love your website because you spent aging crafting unique, high quality content that is focused on your target audience. What you should always remember is that it is important to effectively measure any kind of marketing method, whether it is an email campaign being measured for click throughs, or how many visitors are viewing each page on your website. These are key measurements of how well your marketing is working. Google Analytics is a hugely popular choice when it comes to tracking website usage, partly because it is so easy to use and partly because it is free. – Visit https://www.google.com/analytics to sign up for a new account. If you already have a Google account, you can use that one so you don’t need to create another account. You might also want to take a quick look at the demo video to give you a better understanding of how everything works. – Enter an account name for the website you want to track (if you want to track several websites then make sure you can differentiate between each one easily). – Enter the website name and URL, followed by the type of business from the drop down list. Make sure that you select the correct time zone. – Read through the Terms of Service and if you are happy, click on the ‘I Accept’ button. – You will then be presented with your unique tracking ID with the code that you will need to paste into any page on your website that you wish to track. The ID looks like UA-12345678-1 in terms of format. – Familiarise yourself with some of the settings and if you want to monitor organic searches (where people have found you using a search engine), there is any area to add more than the default list of search engines. At this point you will have successfully set up your account details ready to start using Google Analytics. – You now have the choice between manually entering your code into your WordPress site or opt for one of the many plugins that will do it all for you. 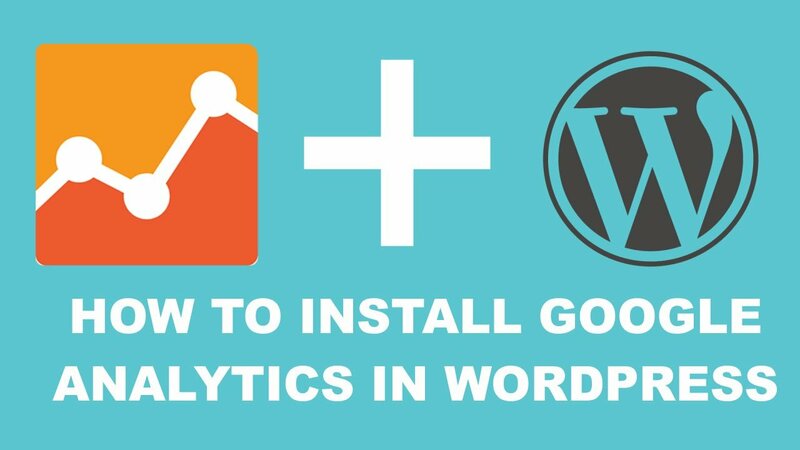 – Because you have already set up your Google Analytics account details, all you need to get started is to click Get Access Code. Copy the code that you are given into the Access Code field and you are ready to go. You will be able to see a Google Analytics section has been added to your dashboard and you can find all of your website usage information in here. Do you need to know how to block IP addresses in WordPress? If so, read on. There are many good reasons for blocking certain IP addresses from accessing your site. Many people choose to do this so they can avoid spam and reduce the likelihood of their sites being hacked. This article has been produced to tell you how to block IP addresses and tell you more about which IP addresses you may need to block to avoid attacks from cyber criminals and similar unscrupulous types. IP addresses can be compared to real-life addresses and telephone numbers. The addresses consist of 4 sets of numbers between 0 and 255 that are separated by dots. All computers that connect to the internet have IP addresses, which are given to them by ISPs or Internet Service Providers. Each time someone visits your site, their IP address is stored in your access log. In turn, each time you visit a website, the event is logged and your IP is stored. The fact that IP addresses are logged is very useful as it makes it easier to identify those engaging in unscruplous or illegal behavior related to your online space. IP addresses have resulted in many people having action taken against them for cybercrime including cyber bullying, hacking and more. However, some people opt to hide their IP addresses via VPN services. This can help them protect their personal information. So, why would you need to block an IP address? Blocking an IP address can protect you from spam of various types including e-mail and comment spam, unwanted visitors, hacking and DDOS attacks. Symptoms of a DDOS attack include websites becoming inaccessible or pages taking too long to load. If you start to receive more spam e-mails or spam comments than usual, you may need to block IP addresses to stop this occurring. WordPress can tell you the IP addresses of anyone that has left a comment on your site. Visit the comment page in the WP admin area to link comments up with IP addresses. Do you suspect you have come under a DDOS attack? If so, the first thing you should do is to look at your server’s access log. Login to the cPanel dashboard linked to your WP hosting account. Head to the ‘logs’ section and click the ’Raw Access Logs’ button. Click on your domain name in the access logs page so you can download the access logs file. You will find the access log file in a gz. Archive file. Click on the file to extract it. There are various options available to you if you don’t currently have a program for extracting such files. You may wish to download a reputable program such as Windzip. Once you have extracted the files, you can open your access log file in a plain text editor such as Notepad. The file consists of raw data relating to all requests that have been made to your site. All lines start with the IP address that has made the request. Take care to avoid blocking yourself, trusted users and search engines from your site. If an IP address seems suspicious, there are IP lookup tools online that you can use to find out more about it. If you have a particularly high number of requests from a single address, this could be the source of the unwanted activity. You can copy and paste the IP addresses you are suspicious about into a new text file. Do you simply wish to prevent certain users from leaving comments? If so, you can do this in the WP admin area. Go to Settings » Discussion and scroll until you reach the ‘Comment Blacklist’ text box. The process is relatively simple – just copy and paste the unwanted IP addresses and click on ‘save changes’. Users with the IP addresses will now be unable to leave comments, though they will still be able to visit your site. However, this should help you win the battle against spam and help you deliver a better user experience for those who aren’t abusing your service. The offending users will see an error message when they attempt to leave a comment. Have hackers attacked your site? If you need to take more drastic steps to challenge those misusing your site, help is at hand. You can block IP addresses via cPanel to stop them gaining access to or viewing your site. This step may be for you if you have come under attack from DDOS or hackers. Login to the cPanel dashboard of the hosting account and head to the security section. You then need to click on the ‘IP Address Deny Manager’ button. This facility enables you to add any IP addresses that you need to block and can be of great value whether you need to block one or several addresses. If you do decide to unblock certain IP addresses – perhaps after learning someone else was responsible for the malicious behavior – you can do so in the same page. Are you being attacked by addresses from across the world? There may be situations where these steps are not enough. If you have come under attack from hacking attempts and DDOS threats from various random addresses from across the world, you can use a Web Application Firewall (WAF) for extra protection. One example of such a service is Sucuri, which is designed to protect you from such attacks and is ideal if keeping up with scores of offending IP addresses is simply not realistic. All of your site traffic will be sent through their servers so it can be assessed for suspicious behaviour. The facility can block all IP addresses deemed to be suspicious from accessing your site. The above steps can help you thwart hackers and keep your WordPress site safe from malicious attacks, so why not get started today? 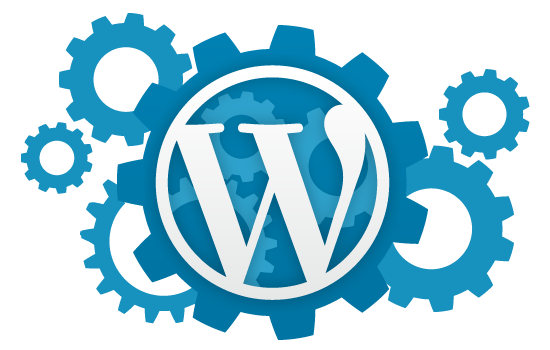 WordPress started out as a simple blogging platform and over time has almost become a full framework for applications. One thing that hasn’t evolved much with time is the text editor or the kitchen sink. Users have been resorting to plugins to add functionality and to give it some style. While WordPress 4.0 did dramatically improve the editor, there’s still plenty of room left for more customization and improvement. Why Would You Customize The Editor? One of the biggest problems with the editor is that you still have to click the preview button to get a feel of how your front end looks. When you add up the time spent switching between your previews and back to your editor to make additional content changes, you’d be surprised how much time is wasted. Basically, you’ll instantly receive the benefit of a true WYSIWYG editor when you customize the text editor to look and function like the front end of your site. If you’re a reseller or build WordPress sites for people, then you know that a lot of your clients aren’t going to be technically capable of managing their own sites or changing content. This is when they end up calling you at 4AM to tell you that they accidentally removed something when they tried to edit their site. Having a true WYSIWYG editor for your text editor will dramatically reduce all of these mishaps. Why doesn’t WordPress have a true front-end editor yet? No one knows but the promise of having one has been on the horizon for years and competitors such as Weebly and Squarespace have made their sites super user friendly by adding front-end editors. It may be because there’s a downside to the front-end editors in terms of functionality and content flow when creating content. Not only that but most of the front-end editors that are offered by those competitors aren’t solid, have bugs, create disgusting code and don’t have things such as Meta boxes. So while you can try to use a plugin like Visual Composer, be warned that not only does it create messy code but they’re often buggy and unreliable. I can’t count the number of times I’ve clicked save and nothing happened or things were deleted for no reason. Warning: This is an advanced tutorial and beginner things like WordPress installation won’t be explained. You should have knowledge of how WordPress works and CSS before beginning. Make sure you’re doing this on a brand new fresh install of WordPress, preferably a remote version on your own computer. It shouldn’t need to be said but don’t do this with someone’s website to test things out, do this on a test website, try out a free theme if you need to. Once there’s same sample content via your fresh WordPress install and a fresh theme to look at, you have to understand how the core of WordPress works and the functions of the text editor to get the most out of it. TinyMCE is a great tool but it’s completely ignorant of anything going on outside the editor. There’s one core file that controls TinyMCE but thankfully for us, the creators have allowed us to load additional stylesheets into it. While it’s great that ever since 3.0.0, you’ve been able to add stylesheets in a function called add_editor_style in includes/theme.php, we’re going to be looking at more efficient ways to call the function. The very first thing we need to do is look for a file called editor-style.css. Does this file exist already for your theme? Taking the steps above, if you’ve determined that there is an editor’s stylesheet in your theme’s folder, then you want to make sure you save a backup of this file and copy it. Call it something like custom-editor-style.css and place it in the exact same folder location. This is far more efficient than backing up the entire theme and database. Next, we need for WordPress to actively search for that file rather than trying to find the default one. To do this, navigate to your theme’s folder and look for functions.php. We need to open this up and call add_editor_style to make sure that it’s going to use your new stylesheet rather than the old one. Add the following code to the theme’s function.php and when you’re done, simply hit save. If you’re editing directly from a FTP client, make sure you re-upload the file. Where custom-editor-style.css is, if you’ve named your new file something different, change it to that name. Next, we need to make sure that the editor is actually using the stylesheet and the default stylesheet isn’t overriding your new one. Simply look at the inspector to confirm this. Earlier we confirmed you’d need some CSS knowledge so you should have a few changes already made in that stylesheet to see if any of the changes have gone through. Are the changes being tracked by the backend as well? Let’s do a quick test by changing the color of your headers. Find the following in your stylesheet or add it if it’s not there. By default, all of the headers should be listed. You can make the color whatever hexcode or color you want and you change the font-size to whatever you want but this is for testing purposes at this point. Is everything working great so far? It should be but let’s test something else by adding a little splash of border to the images in TinyMCE. For this, all we have to do is target the TinyMCE main styling ID which is by default, #tinymce. This is the ID that it automatically generates in the body, regardless of the WordPress version you’re using, as long as it has TinyMCE. When we generate a border for our images, we should see the results instantly. This is the last CSS example we’re going to do because the entire point of this is to make sure that we have complete control over the styling of TinyMCE. From this point on, you should be able to style everything the way you want it now that we’ve confirmed the style changes are taking effect. If you’re new to CSS or styling, there are plenty of guides online such as Codeacademy that’s 100% free and has great tutorials on styling and a lot more. What about Sites That Don’t Have an Existing Editor Stylesheet? The first time you do this, don’t panic if things look broken. It will take some time going back and forth, making sure changes were saved, etc. The steps above should give you a nice base to work with and if you’re new to styling, it should give you some practice as well. One great file to look at is the basic styling sheet for the theme Twenty Sixteen. This is a nice starting point and can help you map out your styling strategy for customizing your own. That’s simply it. With a couple of steps you can begin editing the default look and behavior of your editor to feel far more like a WYSIWYG editor and like the front-end. There’s so much more you can do with the editor as well, such as adding styling based on different post types or custom post types. For these advanced tutorials, we’d highly recommend consulting with the WordPress documentation before touching anything. While there are some plugins that do this for you, they need to be constantly updated, most of them are outdated, they slow down the site and plugins like Visual Composer as mentioned earlier are notorious for bugs, breaking your site, producing messy code and slowing down the site. The steps mentioned above are a great starting point for creating a truly customized editor. We’re still years away from a fully functional WYSIWYG TinyMCE that works flawlessly. Believe it or not, there’s a lot of psychology behind the conversion rate of your website and influencing factors. One of those biggest factors aside from having a user friendly design is the colors of your website. A great design only takes you so far but if you have a poor color scheme, you could be bleeding potential customers. We’ve experienced huge gains from A/B testing on UK Web Host Review by testing different colour combinations. Why do colors affect us so much? 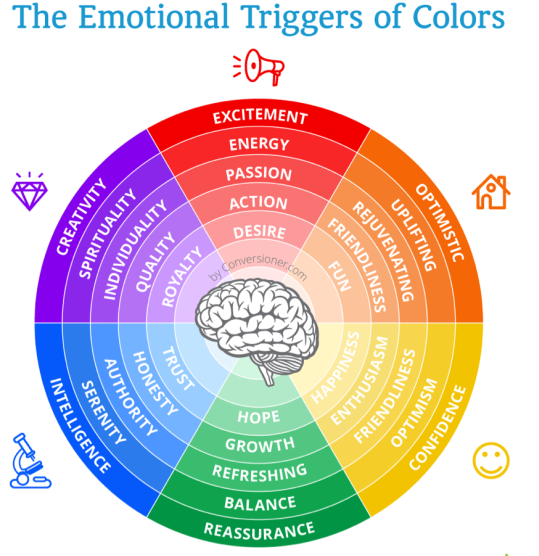 You may not even realize it but when you’re browsing a site, there’s three different factors to take into consideration when theorizing how color affects people so much. First, there’s contrast. The contrast of two colors is simply the difference between them. In art, you use contrast so that you can focus your attention towards a specific element and this is the exact same thing in web design. You use two different colors not only to grab the viewers’ attention and focus on a particular element but it’s also useful for readability. For example, light font on a light background is poor design and contrast. Complementation is the second factor in color theory. 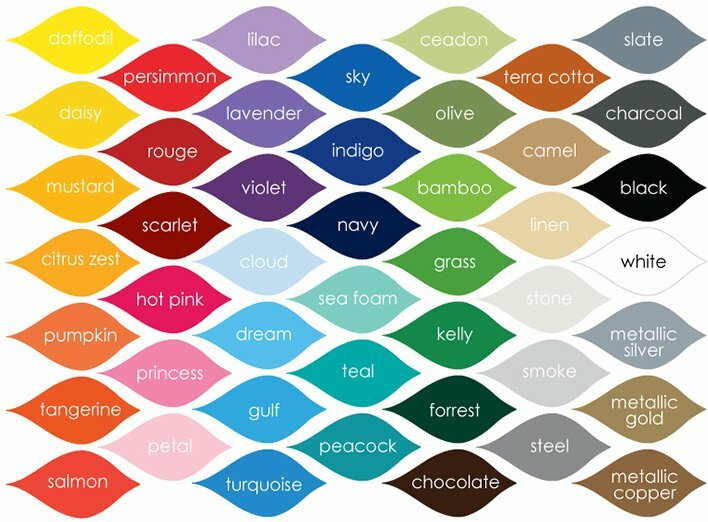 When you look at a color wheel, you might notice there’s two colors that seem to be the complete opposite of each other. Red certainly looks nothing like green but it’s the complementary color. These colors when they’re used together make a great theme and have been shown to increase your conversion ratings. Finally, there’s vibrancy. In general, this is the mood that a color sets for the visitor. Different studies have shown that warmer colors such as red, yellow or orange have been known to energize people. However, cooler colors such as blue, purple and green have put people into a more relaxed state. Red is one color that’s known to make people alert and green is known to get people in the shopping mood. 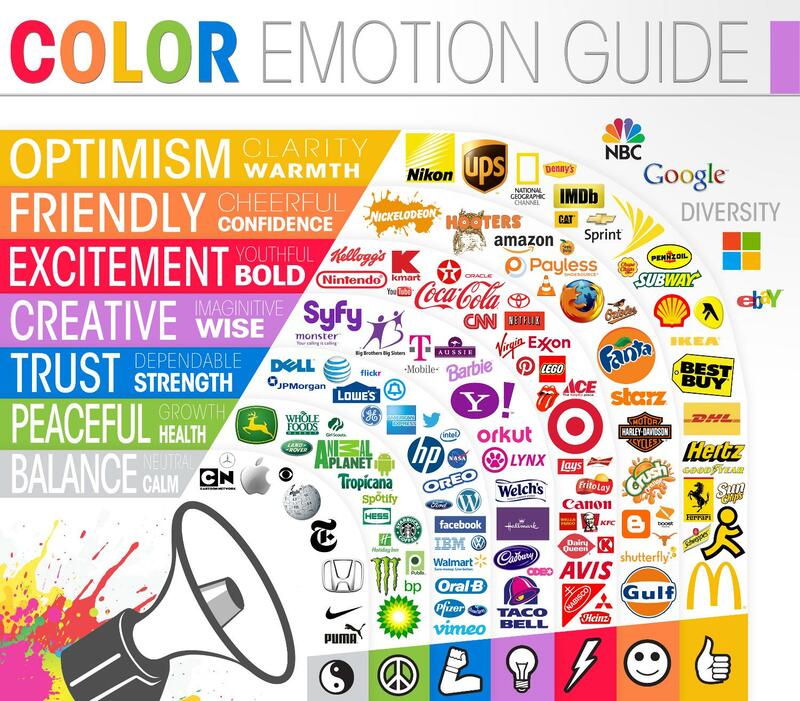 How over millions of years have we developed a mindset to react different to colors? No one truly knows because this isn’t something that we actively taught ourselves. Also, different cultures approach different colors differently as well. For the primary focus of this article, we’re going to focus on increasing your conversions with the western audience and what studies have shown. When designing your theme or site, keep all of this in mind and think about the demographic you’re targeting. It could be the difference between a 10% bounce rate and a 60% bounce rate with a dramatic drop in conversions or clicks. Red – This color is known to keep people alert and put people on edge. It’s the color of excitement and it’s also the color of passion. Numerous lingerie and adult online stories try to utilize red whenever possible, such as the front page of Victoria’s Secret showcasing red lingerie. Obviously there’s a lot of other factors as to why that company is successful but when you want someone to feel excited or passionate, this is your go to color. Yellow – When you think about the color yellow, you probably visualize the summer time and a nice cool breeze. Yellow is warmth and also represents hospitality. This color can put people into a relaxed state of mind or give them a little more trustworthy feeling of the site they’re on. Orange – As you may have guessed, orange is usually associated with Thanksgiving and Halloween. Orange is the color that represents the start of autumn and harvest. This is common tradition for the west as September through November is when Thanksgiving and Halloween occur. However, this color isn’t particularly known to affect one’s mood so much above the others. Blue – There’s primarily two different mood factors here for blue. First, there’s the negative context of blue which means sadness or depression. It’s commonly used by pharmaceutical companies trying to sell anti-depressants and the sales numbers don’t lie, it works. However, in a positive context it means authority, power and trust. Believe it or not, a blue tie in an interview can give you an authority look. This is the same reason banks love to use blue on their logos. Green – This color is one of the broadest colors out there that can be used for a wide variety of things. First, there’s the luck of the Irish, which is why you commonly see green themes everywhere during the month of March. Then, you have pro-environmental groups that use green as their main theme because it represents nature and environment. However, green can also be used by get rich quick sites or sites trying to get you to buy something because it embodies the traits of jealousy and envy. You see some rich smug guy on a get rich quick page driving a nice car? There’s more than likely pictures of money with some hints of green on it. This is designed to make you jealous to bring you one step closer to clicking that purchase button. It’s not because rich people are obsessed with the color green. White – This is the most common background color used on websites. It represents peace or purity and isn’t threatening in any manner. It’s also used for religion, weddings and hospitals. Black – This is the most depressing color on the list as people commonly think of death and formality with this color. However, for web design purposes, if used correctly, it can be a color of force or control. Brown – This is not an appealing color for your website and in most cases should be avoided but it represents the Earth and health. It’s known to be stable or dependable. Pink – The stereotypical color that is thought to be every woman’s favorite. Why are western women so attracted to the color pink? The reason for this is because pink is known to represent fun, childhood and sweetness. It’s also thought to be the color of femininity. In order to effectively gauge what color scheme works best for your WordPress site, you need to understand the conversion funnel or at least have one mapped out. While the colors are being taken into consideration, there’s a specific process that happens when a user comes to your website. First, they have to become aware of the elements you want their attention drawn to – VPNGeeks is a good example of a site that has a clear and concise layout. Second, they need to become interested in what you’re selling. Third, they need to have the desire to press forward with the decision. Finally, there’s the conversion. Awareness – This is essentially the marketing of your website or your brand. A brand can exist on its own but your website won’t get customers or traffic simply by existing. People need to be aware that your site exists and you need to understand your target audience in order to attract customers. Interest – Once your visitors have landed on your site, you now need to interest them. You need to act fast because the average user only spends a few seconds on a website before they close the tab, creating a bounce. A bounce is when someone visits your page and leaves it without visiting any other links on the page. This negatively impacts your SEO. This stage should focus on the color scheme, your headlines, your images and compelling copy content. Desire – Anyone can build interest in a product, if they weren’t interested already but now you need to give them the tool to want what you’re selling. You need to conclude with a multitude of different things in order to build desire other than your product simply existing. You need testimonials, you need a great color scheme that represents the mood of your product and audience and you should give the customers options. When you’re planning out a site, it’s a general rule of thumb to have 3 different colors selected that best represents your demographic, your brand and your product. Not only do you want your design to be visually impressive but using the guide above, you want something that will positively impact their mood based on what you’re selling. For example, selling wedding services with a primarily black theme will tank your conversions. You also have to take colors into consideration when designing your call to action button. The call to action button is when people finally reach the desire stage and are ready to purchase. This is the button clicked when they’re ready to make a purchase. Studies have shown that red call to action buttons have been the most effective for most websites. Before you even begin, what is the goal of your website? What do you hope to accomplish? One Time Sales – Are you hoping to capture customers for a one time sale? Email Opt In – Do you hope to capture emails so that you can send our promotional offers and newsletters? Recurring Sales – Do you hope to acquire customers for a monthly or yearly service? Affiliation – Are you affiliating for another website and sending visitors to another sales page? Maximizing your WordPress conversion rate has very little to do with your personal preferences. You really have to step into the mindset of your customers and think about what they want to see and what kind of tone you’re setting when someone first sees the website. 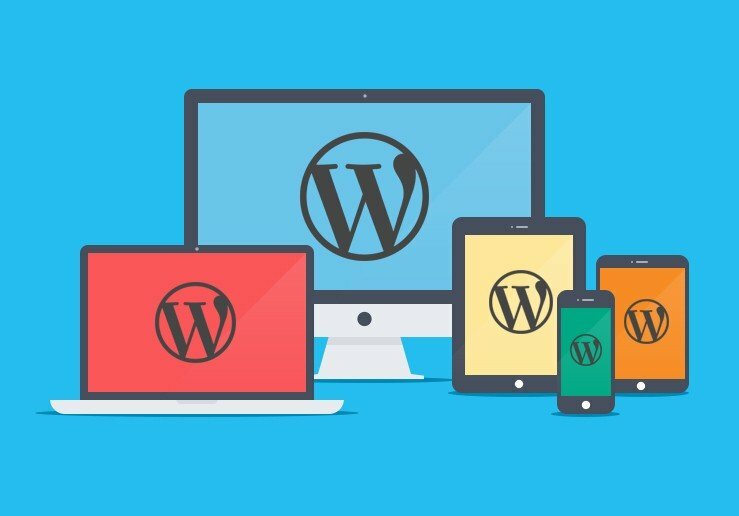 WordPress maybe one of the simplest Content Management Systems to get started with, but when it comes time to start adding functionality to your site and getting things looking just the way you want them, be prepared to clear at least a few hours of your time. Indeed, whilst WordPress’s instant installation is touted as a major selling points among web hosting companies who offer it, setting everything up to be just the way you want it (whilst keeping SEO in mind of course), takes much longer. This is particularly true of the navigation menu, one of the most critical parts of your entire site. Yet as complicated as it may seem to setup your WordPress menus and incorporate them into your site, you’ll soon be on your way with this comprehensive how-to guide, where I’ll take you step by step from accessing your menu panel to putting those all-important links on your website. 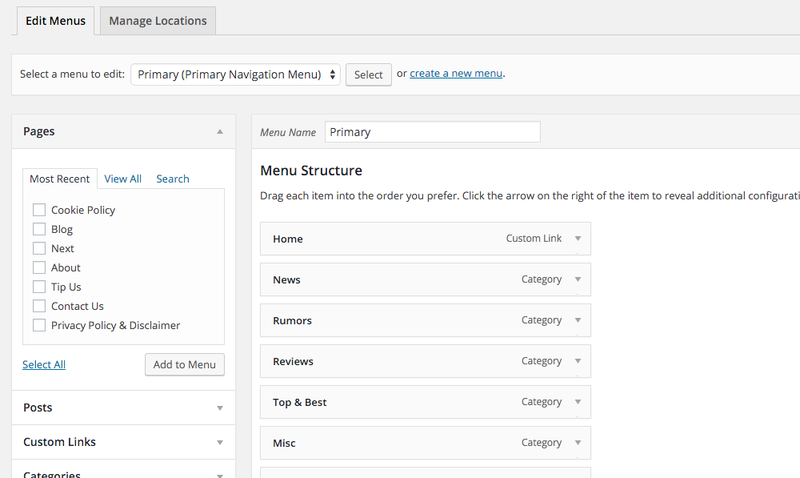 Menus in WordPress is the simple solution to offer a proper navigation to visitors. In most cases, it displays links to your content in the horizontal bar across the top of your site, and -depending on theme you’re using- can often be incorporated into secondary areas of your site, too. 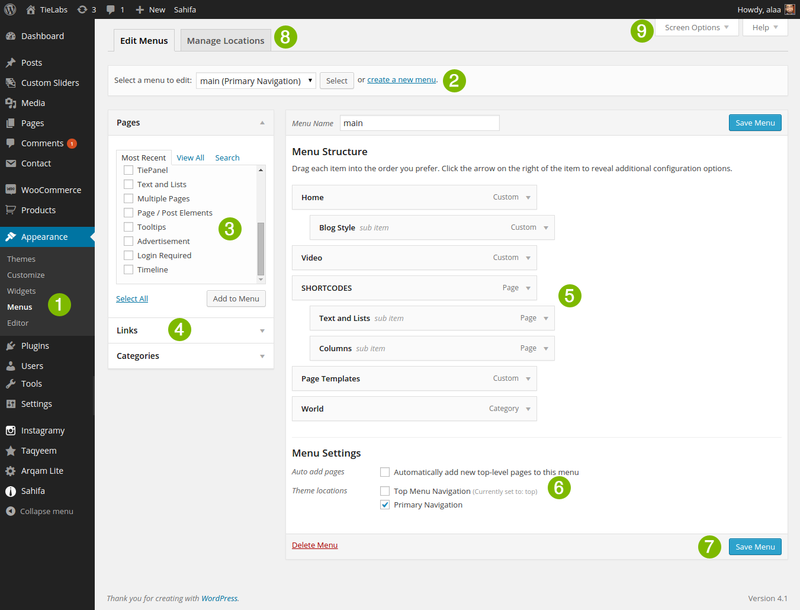 WordPress introduced this feature in its third version, and since then it has been a valuable part of the CMS. By default, it isn’t setup, and thus requires some manual effort to get your menus set upand displaying on your site. Once you’ve got all the pages set up and published, head over to the Menus option available under the Appearance section in the left-hand menu panel on your WordPress dashboard, and hit the link to open it. 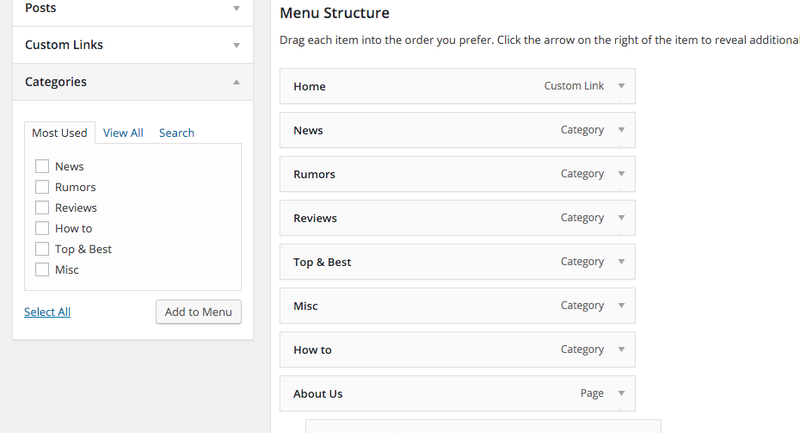 Click on create a new menu link and give your menu a name so that you’ll always be able to access it easily. Select the menu you just created (it will be selected by default if this is the only Menu available) and select the elements from left side section. Click ‘Add to Menu’ and watch as these elements are moved over to the right side section. This is how you insert elements into Menus. You can put in Pages, individual Posts, or Categories, or even custom links (can be used to showcase Tags). Once all those elements are available on the right side area, you canto re-arrange them in any order you wish. If you wish to keep a particular element or category as Child one, drag it slightly towards the right side and put it on its Parent one. It isn’t necessary for a category to be a Child one to make this thing work. Once you’re happy with the arrangement, select the Location as per the Theme and click on Save Menu button. In future, when you think of making a change in the Menu, or re-arrange the elements, you can come at the same place, select the Menu, make changes, and hit the Save Menu button to make those changes publicly visible. Also, if theme allows showcasing menus on different parts, like primary area, secondary area, or footer area, then all you need to do is, create a dedicated menu, and select the position of it. This sure wasn’t quick but I hope it was easy enough for you to remember in future. What if Theme doesn’t support Menus? Many outdated themes don’t come with support for Menus, and if you happen to use one of them, then there is still a way to make things look friendly. You sure can’t display a properly functioning menu on the top area or even the footer one, but you can do that in the widget section. 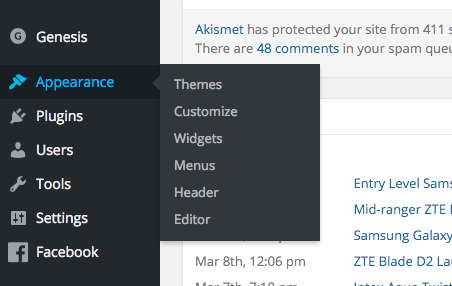 If the theme supports a sidebar, then you need to create a Menu by following the aforementioned steps and save it. Then, move to the Widgets section and using the Custom Menu widget, you can showcase those Menu elements in the sidebar. In the worst case, if the Sidebar isn’t supported, then its high time to look for a modern theme. As mentioned numerous times in this guide, Menus are among the primary elements which increase the user experience and the usability of your website. It helps the visitor to wonder around your blog through its structure and reach other pages and sections. But, it doesn’t mean that you need to put everything in the Menus section. To make it simple and straight, I usually keep Categories and few more important pages on the Menus like About, Team, Privacy & Disclaimer, Contact Us. If there are Child categories, then I arrange them under their particular Parent one, in order to achieve more user friendliness. Always keep the primary Menu on the top, maybe below the logo or completely at the top. If possible, keep it sticky so that it scrolls down and user has access to it everywhere. Finally, there is a trend of keeping the Logo within the primary menu. This helps in saving some space in the top area, and thus more content is visible in above the fold area. You can also opt for this layout for obtaining higher user experience points. By now, you’ve hopefully got a fully functional menu up and running on your website by following the simple steps above. If not, do let me know in the comments section below if I’ve missed anything out that you were hoping to see covered. Are there other aspects of building a WordPress website that you’d like me to cover in future How-To Guides? Again, drop me a note and let me know. Until then, thanks for reading, and best of luck with your new website! Better WordPress performance is something most site owners strive for at some time or another. After all, the faster your sites load, the more likely you are to keep visitors on there and have them check out what you have to offer. As with just about everything on the world’s most popular CMS, there’s a wealth of plugins to help you do just that with limited technical know-how. Remember that no matter what web hosting you have, it’s key to optimise your site as much as you can. 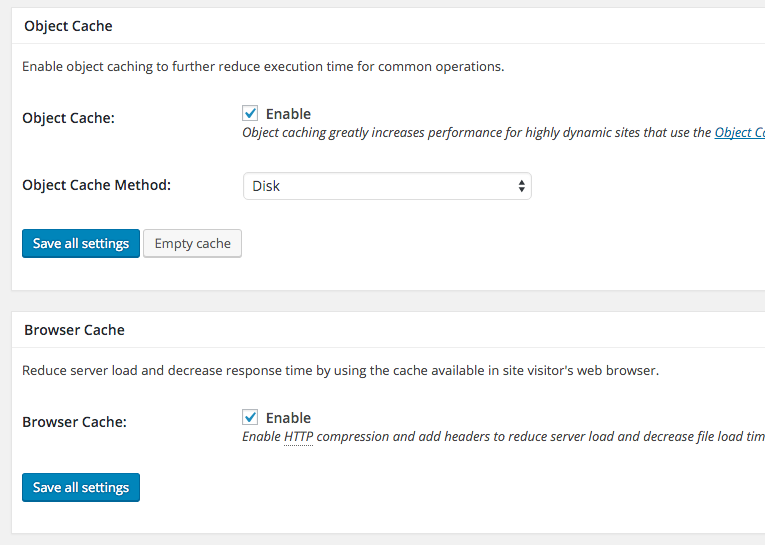 Tracking performance (site loading times) has always been an important aspect so once you’ve found the perfect host you can continue optimising by using a caching plugin. Among the best of the bunch are W3 Total Cache and WP Super Cache. Both of these include tools and features designed to reduce loading speeds and deliver better all round performance. 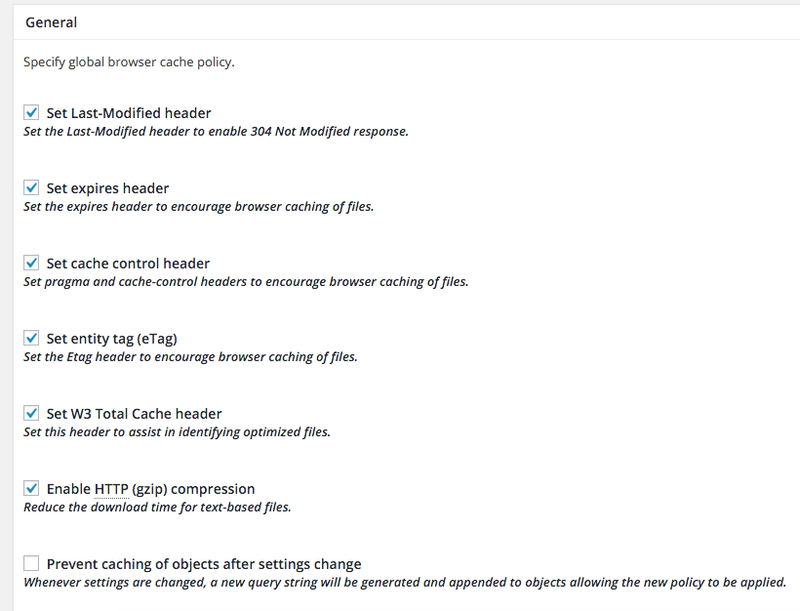 Yet whilst the latter is a simple, no-frills plugin which covers the basics, those looking for a fully comprehensive approach to improving their sites are often better suited with W3 Total Cache, a tool which -I’ll be honest- can take some getting used to. 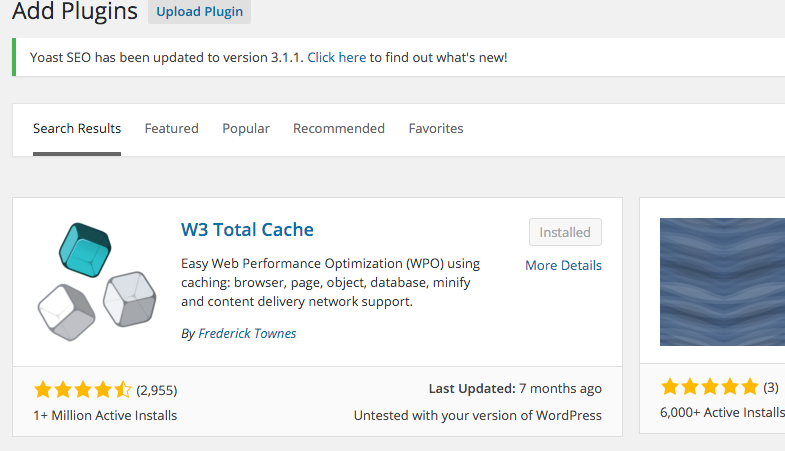 I use W3 Total Cache on all my WordPress websites as I personally prefer this plugin over its competitors, having spent a lot of time configuring the different options available and seeing positive results. 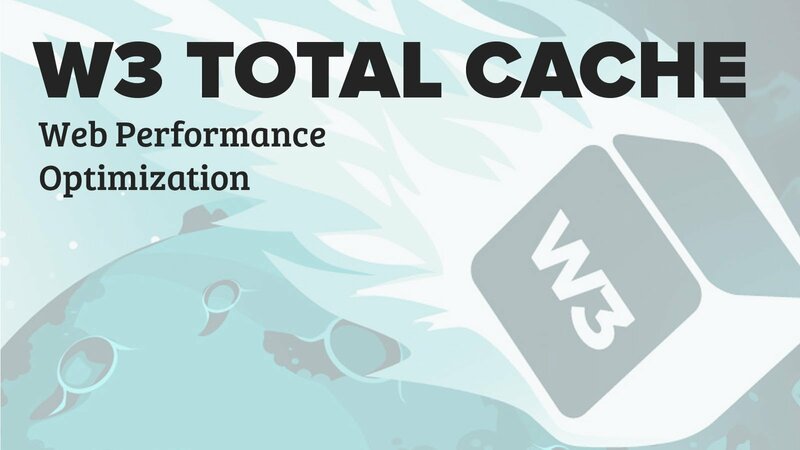 To help you do the same, I’ve put together this step-by-step guide to installing and configuring W3 Total Cache. The setup procedure goes through both simple and advanced set of tools, so you need to follow each and every step with precision. Before we go any further, it’s a good idea at this point to use a website testing tool like Pingdom or Google PageSpeed to see how your website is currently performing. Once we’re done, you can go back and run the tests again to see the difference in real time. 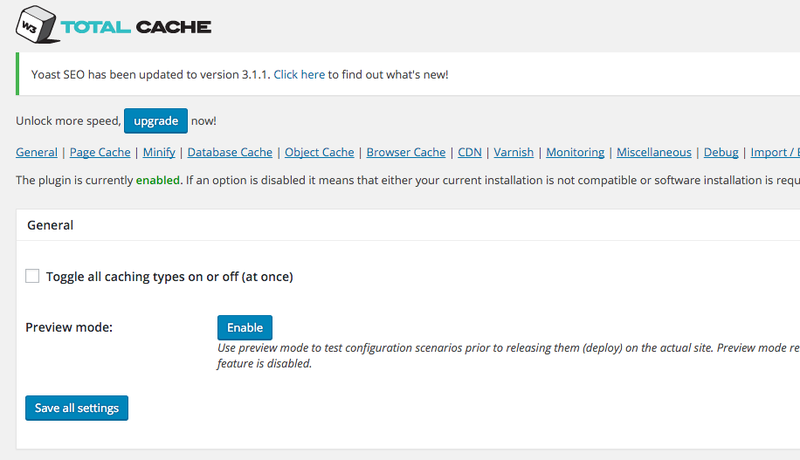 The first obvious step is to install W3 Total Cache plugin. 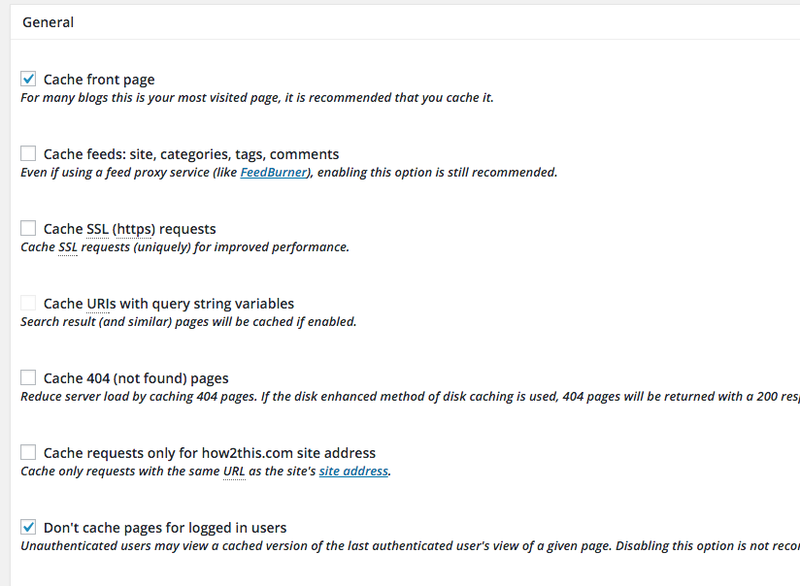 You can either download its package from the WordPress Plugins Directory, or search it inside the Dashboard itself. Either way, get it installed and activated. Now in the left-hand side list inside Dashboard, you’ll see a new column added, named Performance. You need to click on this and select the General settings first. You need to leave the General tab untouched and scroll down to the Page Cache section. Under this, Enable the Page Cache option and select Disk: Enhanced option from the drop down list ahead of the method. Up next is the Minify section, which again needs to be Enabled. From there, select Auto option from the mode. Select Disk as the method and leave rest of the options as Default. 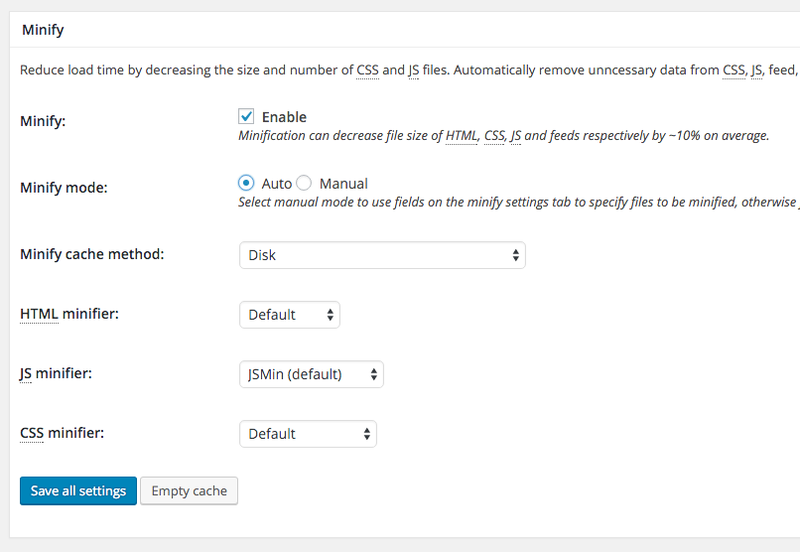 In the case of using MaxCDN, you need to keep the Minify mode to Manual. Keep the Database Cache Enabled and select Disk as the method for it. Next, keep the Object cache Enabled and again keep the Disk as the method for it. With that done, keep the Browser cache Enabled and hit Save all settings button. The General setting section ends here and whatever is left underneath or above, is required to stay Default. Now, after making the General settings happy, we need to dive into individual ones. Starting with the Page Cache, you need to enable first, second, and second-from-last options. You can leave the remaining options untouched. Scrolling down, you’ll find Cache Preload option, where you need to enable Automatically prime the page cache option and make sure to click on Save all settings button. Keeping the Minify, Database Cache, and Object Cache options as default, click on the Browser Cache option from the left sliding menu. Over here, Enable the first Six options and leave the rest on default. Click on the Save all settings button underneath and you are good to go. Now after getting over with all these settings and tweaking, I’ll recommend to check out the current grades of your website using FTP tool of Pingdom and also using Google Page Speed insight. I’m sure you’ll find improvement in each of them. The key thing to note here is that I never went into the details of any individual option. That’s because a lot of these things are technical in nature, and to be honest, what’s important isn’t so much how they work as much as it is that they get the job done. If you do want to look further into how each option helps you to achieve better WordPress performance, a good technical web developer or Search Engine Optimisation blog should provide everything you need to know. Also, if you’re still not satisfied with the performance improvements, I’d recommend using a CDN network. You can start with CloudFlare which is free to begin, offering limited options, or you can opt for much advanced MaxCDN which offers tons of features and a guaranteed improvement. This is included in most of the hosting companies that we have reviewed. The second one is paid and comes with a premium support team, always ready to help you out in any situation.